Welcome to the Krome Kitty Car Club! That’s right Kitties, due to circumstances beyond our control, we are no longer a motorcycle club. We have become a Car Club. For the third time in a row, we have been forced to leave our bikes tucked in our garages and sought shelter in our cars. It all started last October when we TRIED to ride to Peabody and it rained…rained hard! Then fast forward to the April Meow Mixer when we TRIED to ride to Five Guys Burgers and Fries and it snowed! And then on April 21st when we TRIED to ride our bikes to Buhler, it did what it hasn’t done since last October on the Peabody ride – it rained! Anybody see a pattern here? I swear Mother Nature must have a vendetta against the Krome Kitties because it never snows…it never rains…except on a Krome Kitty day. However, when life gives the Kitties lemons, we ask for tequila and salt! Ain’t a little bit of rain and cold temperatures gonna keep these girls from having a darn fine day! Denise offered to pick me up at my house and drive to the QuikTrip in Park City. While she was driving, I real quick texted everyone who was going and said, “Because it’s raining, let’s all meet up inside the QT for car assignments.” Upon arriving, we all gathered around the ATM and coffee machines so everyone could money up and juice up and try to be as inconspicuous as possible. We were doing a pretty good job of that UNTIL Suz opened up her brightly colored, ruffle trimmed skull umbrella. Nothing says “blending in” like an open umbrella inside a dry building. But then again, when has Suz EVER blended in? (winkwink) Because the umbrella caused enough of a spectacle, I announced that the 50/50 tickets would be sold at the restaurant. I took roll call and once everyone was accounted for, I assigned riders to the drivers who were Tricia, Suz, Kathryn and Dawn. I called All Aboard and we were on our way to the bright city lights of Buhler, Kansas! Our lead driver, Kathryn, drove us right to the door of The Mustard Seed and we all filed inside to be greeted by some mighty friendly staff who seated us at a loooonnng table for fifteen. There was only one other table in the room and I assumed they put us in this back room all by our lonesome because they heard how rowdy the Kitties could be and they didn’t want their other diners to be disturbed. Not long after I set up my Kitty Boutique and we all got settled in our seats, in walks an older couple who sat at that very table, which was in VERY close proximity to those rowdy Kitties. I immediately looked over at them and said, “You’re probably going to regret that decision to sit there. We can get kinda loud…actually very loud.” “That’s OK, we don’t mind and we can get kinda loud ourselves”, they responded. That was all I needed to hear to know that this was one cool Grandma and Grandpa and they were going to be very fun neighbors. Joy, Grace, Dawg, Ruff, Candy (cuz she’s so sweet but she ain’t a stripper so we quickly abandoned that one), and UpChuck or just Chuck (cuz she gets carsick but who wants their name to basically be puke?) Finally, Kari suggested Sugar. That’s it! It’s perfect! Lily is sweet like sugar and it’s adorable so Sugar it is! And then the time had come for the 50/50 drawing. I counted out the cold hard cash and there was $80.00, so some lucky Kitty (not me) was going home $40.00 richer (not me…again.) I gave Tumbleweed the honors of drawing the ticket and the new member phenomenon struck again! Kim, who was attending her very first Road Trip, won that dang pot! I should be keeping a list of how many times a new member won on her first ride. On second thought, let’s just make a list, shall we? It all started with Amy when she joined in October 2014 and attended that last ride of the season…and won. Then there was a guest rider in 2016 by the name of Dominque Kadatzke (who can forget THAT experience on the Misadventures of Moline?!) who only rode with us that one time, but that one time was enough to send her home with the winnings. Then there was Brenda, who rode her first ride in April 2017 and won; then Chris’ boyfriend (which is close enough in my book) won the Tom Kat drawing last September, which was her first ride; followed by Annette who joined us for lunch for the first time in Peabody last October and…you guessed it, won the pot. And now Kim! That’s SIX, yes I said SIX!, first time KKMC riders who have been winners! For crying out loud people! I’ve been riding with this Club for 14 years and I HAVE NEVER WON!! What’s a girl gotta do? Quit and come back as a new member? I know what you all are thinking….how about you quit and NOT come back? Hey! I’ve got feelings, ya know! 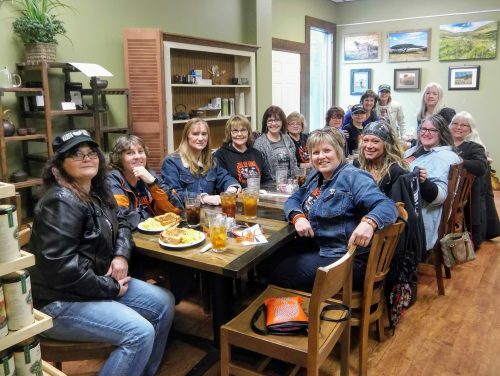 After I licked my wounds and sold a few things from the Kitty Boutique, it was time to settle up the tab at the restaurant and say our good-byes to Tumbleweed and Straight Shooter. Because they were such great sports and neighbors, I made Tumbleweed an honorary Krome Kitty and gave her a KKMC spot pin in her favorite color – orange. That just made me love her a little bit more. We got some shopping to do! Some of us went to Adrian’s A to Z (which by the way, they literally have everything from A to Z in that there store) and a few wandered over to the thrift store across the street. Of course, our Bling Queen, Kim, zeroed in like a kitty to catnip on the shiny baubles at Adrian’s. After we took advantage of the 20% off one item at Adrian’s we met back up at 1:00 to start making our way south. We had more shopping to do! It rained all the way home and it brought back the not so pleasant memories of our very wet ride home from Milford Lake last year. We were a lot more comfy in our warm, dry cars although I commented several times what a great ride it would have been if we could have been on our bikes. Someday, we WILL be motorcycle riders again. I hope. Those of us who didn’t have commitments to get home to attended Sgt. C’s Grand Re-Opening to see their new shop and take advantage of the 50% off everything sale . Maureen bought a new vest so she could display her Road Name and Member Number patches. She then proceeded to buy about a dozen other patches to fill up all the blank space. Pace yourself Moonshine! Oh wait…Moonshine pace herself? Now that’s funny! So, our first ride of the 14th season was not on our bikes, but regardless of the transportation, we had fun, we laughed, we jibbed and jabbed with each other and we enjoyed each other’s friendship. Despite the dreary cold weather, that’s still an awesome day! Huge Kitty Kisses to those who offered up their cars and gas to transport everyone to Buhler and back. Kathryn, Dawn, Suz and Tricia – you ladies are the best! Those who attended the “All Aboard for Buhler” ride were Queenie, Half Pint, River, Sugar, Squirrel, da Vinci, Tink, Star, PonyGirl, Lady, Lil Pibble, Moonshine, Sycho, Ice, and BatKat. Sounds like a great time was had as usual! Love it! Always a good time with my sisters from different misters!